Glasgow City Council, the local government body of the city of Glasgow, Scotland, became one of the newly created single tier local authorities in 1996, under the Local Government etc. (Scotland) Act 1994, with boundaries somewhat different from those of the City of Glasgow district of the Strathclyde region: parts of the Cambuslang and Halfway and Rutherglen and Fernhill areas were transferred from the city area to the new South Lanarkshire council area. 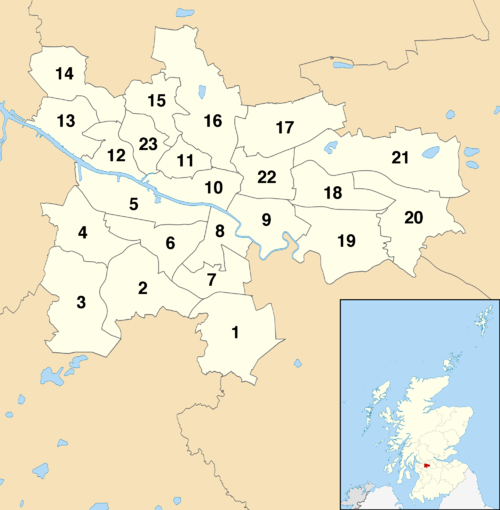 The district had been created in 1975 under the Local Government (Scotland) Act 1973 to include: the former county of the city of Glasgow and a number of areas previously within the county of Lanark: Cambuslang (Central and North, and South lying outwith East Kilbride), Rutherglen (including the burgh of Rutherglen), part of a Carmunnock area (that lying outwith East Kilbride) and Baillieston, Carmyle, Garrowhill, Mount Vernon and Springboig. The early city was run by the old "Glasgow Town Council". In 1895, the Town Council became "The Corporation of the City of Glasgow" ("Glasgow Corporation" or "City Corporation"). It retained this title until local government re-organisation in 1975, when it became "City of Glasgow District Council". 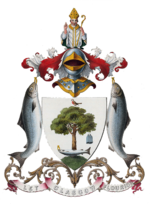 In 1996, following the dissolution of Strathclyde Regional Council and Glasgow District Council, their responsibilities transferred to the new single-tier local authority Glasgow City Council. The title Lord Provost of Glasgow, used now for the civic leader of the city council, has history dating from the 15th century. During World War I, the council was unique in the United Kingdom in appointing an official war artist, Frederick Farrell. Glasgow Corporation Transport was under the control of the Glasgow Corporation, and ran the local buses and Glasgow Trams, until it was superseded by the Greater Glasgow Passenger Transport Executive on 1 June 1973. During the period of two tier local government (Local Government (Scotland) Act 1973), 1975 to 1996, Glasgow District Council was responsible for refuse collection, museums, libraries and housing, while Strathclyde Regional Council had responsibilities for policing, fire service, water, education, social work and transport. The city council established in 1996 (Local Government etc. (Scotland) Act 1994), took on the powers and responsibilities previously divided between councils of the Glasgow City district and the Strathclyde region. The council area borders onto East Dunbartonshire, East Renfrewshire, North Lanarkshire, Renfrewshire, South Lanarkshire and West Dunbartonshire. The council is ceremonially headed by the Lord Provost of Glasgow, who is elected to convene the council and perform associated tasks as a general civic leader and Lord Lieutenant. The current incumbent is Eva Bolander. The council consists of 85 councillors elected for a five-year term from 23 wards. These wards were introduced for the 2017 election, replacing those introduced in 2007, and each returns three or four members by the single transferable vote system of election. This system was introduced by the Local Governance (Scotland) Act 2004, as a means of ensuring a reasonably proportionately representative outcome. The most recent full council election took place on Thursday 4 May 2017. The Scottish National Party became the largest party (39) but did not gain an overall majority; Labour returned fewer councillors (31) and lost overall control, with increased numbers for the Conservatives (8) and the Greens (7). Prior to the 2007 election, there were 79 councillors elected from 79 single-member wards by the plurality (first past the post) system of election. The result from this system in 2003 was 69 of the 79 councillors representing the Labour Party, although that party gained only around half the votes cast in the election to the council, and the Scottish National Party represented by just four councillors, despite gaining some 20% of the votes. There were also three Liberal Democrat councillors, one Conservative councillor, and one Scottish Socialist Party councillor. The 1999 council election result was even more skewed in terms of seats and overall vote share due to the voting system in use, with Labour receiving 74 seats (94% of the seats) from 49% of the vote and the SNP receiving 2 seats from 29%. ^ "Glasgow's new Lord Provost is revealed". Evening Times. ^ "SNP will run Glasgow Council as minority". 18 May 2017 – via www.bbc.co.uk. ^ King, Hannah. "Upcoming elections". www.edinburgh.gov.uk. ^ "Glasgow's forgotten war artist Fred Farrell". Herald Scotland. 24 May 2014. Retrieved 9 May 2015. ^ "Garscadden/Scotstounhill councillor to oversee all city schools as new minority SNP council takes charge". Clydebank Post. Retrieved 20 May 2017. ^ "Glasgow City Council on Twitter". Twitter. Glasgow City Council. Retrieved 18 May 2017. ^ "Local Ward Factsheets". Glasgow City Council. 1 January 2017. Retrieved 6 July 2018.